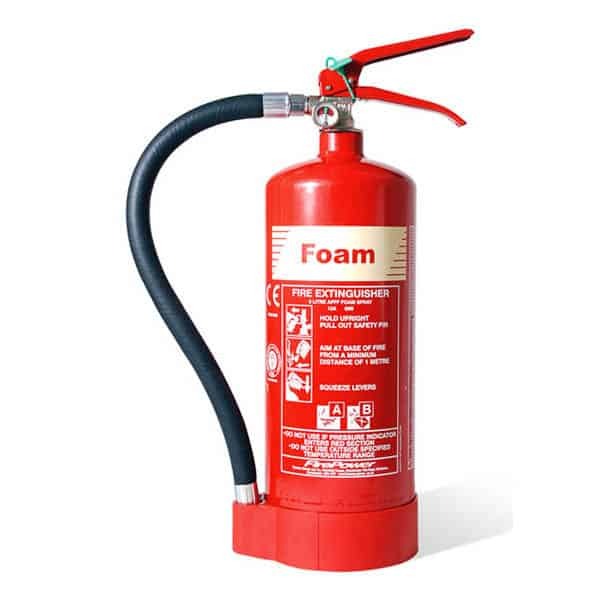 Foam fire extinguishers are one of the most common types of fire extinguisher, and are generally used for fires involving flammable solids and liquids. We explain all in our simple guide. Summary: foam fire extinguishers are good, general use extinguishers, suitable for the majority of premises. Please note: foam extinguishers are not explicitly designed for use on electrical fires. The 35kv conductivity test is an additional safety measure intended to safeguard users who accidentally use a foam fire extinguisher on an electrical fire – there is a risk to using a foam fire extinguisher this way, including the possibility of getting an electric shock. We strongly recommend ONLY using a CO2 extinguisher or a Dry Powder extinguisher for electrical fire risk. Foam fire extinguishers work in 2 ways. Firstly, they are mainly water-based and so have the same cooling effect as water extinguishers, putting the fire out by lowering the temperature. Secondly, they contain ‘Aqueous Film Forming Foam’ (this is why they are also known as AFFF foam extinguishers). AFFF works by smothering the fire and sealing in the flammable vapours. This prevents the fire re-igniting. It also allows foam fire extinguishers to put out flammable liquid fires, by creating a barrier between the liquid’s surface and the flames. Pros: non-toxic, non-damaging to most materials, largely safe if accidentally used on electrical fires (although this is not recommended), designed to prevent the re-ignition fires, lighter in weight than the equivalent water extinguisher. Cons: damaging to electrical appliances. Dangerous if used on cooking fires or flammable gas fires. In fact, most premises benefit from having foam extinguishers and these are frequently recommended, especially when paired with CO2 extinguishers for use on electrical fires. 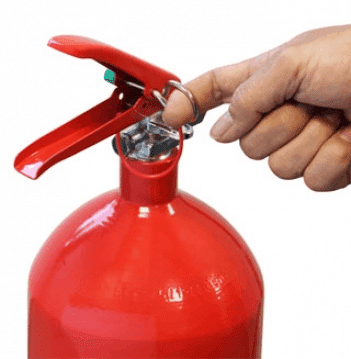 Foam fire extinguishers need to be used differently, depending on the type of fire. If you think you need foam fire extinguishers, or if you’re not exactly sure what you need, just get in touch with our friendly team by calling 0845 845 3001, or emailing info@surreyfire.co.uk. They can arrange a free survey visit for you from a BAFE registered engineer. All extinguishers we supply come with a 5 year guarantee, and we will fit and commission them for you, free of charge.